The Future of Design-Build: At the General Session on Thursday, November 3, titled Reading the Tea Leaves — Adjust, Adapt, Act, Lee D. Smither, Managing Director, FMI Corporation, will peek into the future and explore forecasts for key markets, assess areas of growth and decline and take a look at how the emerging talent market is changing how the industry does business. We will also take a close look at the future of design-build, based both on industry data, as well as on feedback from industry leaders such as you. Please take a moment to complete this short survey so that your input is considered as part of this presentation. Results will be used in aggregate form only and will help us provide greater insight to conference attendees about the future of design-build. The survey will take no more than 15 to 20 minutes to complete. Roll-out of DBIA’s new Standard Form of RFQ/RFP and Guide: One of the most important ways owners manage the risk of achieving success in a project is selecting a design-builder who is best suited to perform the work. To determine the best suited design-builder, owners must design a procurement process that is focused on finding the right team for the project. DBIA’s new standard form of RFQ/RFP and the accompanying Guide will assist owners with understanding the issues owners should consider and decisions owners need to make to create a procurement process that is most likely to lead to a successful project. Under the leadership of Robynne Parkinson, JD, DBIA, DBIA has been diligently working on these frequently requested documents to be released and reviewed for the first time at this year’s conference. Progressive Design-Build: What is Progressive Design-Build (PDB) and what can it achieve? Join industry leaders as they release for the first time the Progressive Design-Build Primer. A panel including a legal expert, general contractor and owner will talk candidly about this topic. PDB is becoming more common in many sectors with water/wastewater leading the way. 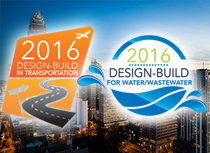 In a follow-on session, experts from the water/wastewater sector will discuss a new Standard Form of Contract for Progressive Design-Build co-produced by DBIA and WDBC. Small Project Spotlights: There is a misconception that design-build is only for mega projects. This year, we are debunking that myth by having several “Small Project Spotlights” throughout the conference in Las Vegas. Hear how smaller government agencies such as the City of Grandview, Missouri, or a public charter school, Trinity Basin Preparatory, achieved success using design-build. 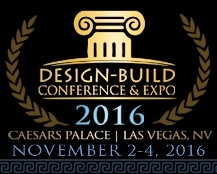 With over 25 sessions to earn continuing education credit, these are only a handful of the many reasons to attend the 2016 Design-Build Conference & Expo in Las Vegas. Continuing education credit can be used towards your DBIA credential or renewal, is approved by AIA and DBIA issues certificates of attendance for self-reporting by others. In addition, for the first time, DBIA is providing two (2) CEUs to those attending the Awards Dinner on Thursday, November 3, celebrating people and projects in design-build. To register, please visit our website here. Register by September 19 to take advantage of reduced early bird pricing. Online is the fastest way to complete your registration; however, PDF documents are available for individuals to download and return to meetings@dbia.org.